Are you wondering how to set up Linkedin Endorsements properly? A fantastic new feature has been added to Linkedin profiles called ‘endorsements’. The concept behind these is a bit like ‘Recommendations’, but rather than a complex process of asking, waiting, reminding and then finally writing or rewriting the end result until both parties are happy. This idea is a bit simpler. Here’s a bit of a guide to how they work and how they can be used for reputation marketing and reputation optimisation. Firstly, if you don’t want Linkedin to guess which ‘Skills & Expertise’ you have, you need to define the skills & expertise you actually want to be recognised for. Head over to the relevant section on the menu bar as shown in the image below. 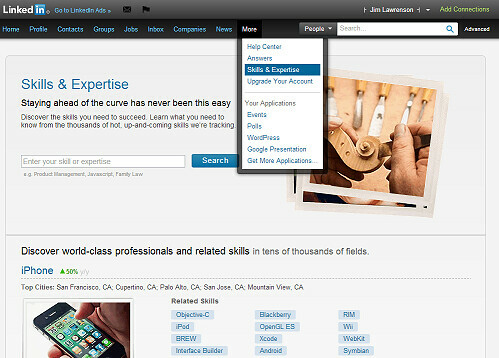 Linkedin tends to pick a list of skills & expertise for you and then show these to your profile visitors at the top of the page when they visit your profile. This is a nice feature with a rather major flaw – it doesn’t necessarily pick skills which are your priorities. See the lovely ‘blue box’ below . I would like to say that I do have all of the above skills, but currently, I would rather not be known for my ‘Data Admin’ skills, or ‘Telemarketing’ as they are not a priority right now. So herein lies the flaw. This box is shown to all new visitors to my profile with a yellow ‘Endorse’ button. The issue is that when they press the big yellow button, it endorses all of these skills at once. Before long, I was becoming the world’s leading Data Admin, so I took some immediate action and deleted ‘Data Admin’ from my list of skills. Which did precisely nothing to stop it appearing. In fact, it is still recommending this to my visitors (as you can see above) and as of today, a week later, it is still one of my ‘default five’ although it hasn’t been listed as one of my skills for over a week. I have emailed Linkedin asking them to rectify this but until they sort this out, I would recommend only choosing the skills & expertise you want to prioritise before you start asking for endorsements. In an extreme case, you may end up being the leading expert in balloon folding or morris dancing. Great skills to have, but not when applying for a role as a cardiac surgeon. What happens if you have no skills listed on your profile? As you can see above, this is Peter. He has no skills, in fact he also has no history or connections. On that basis, I would strongly recommend adding at least 5 skills to your profile to give the ‘Blue Box’ a head start. Ok, now we have some skills added and we have requested some endorsements from our connections – what next. Linkedin Endorsements – The Guide – Part 2Facebook Likes – Are you simply paying for the right to keep on paying? Should I be upgrading to a Linkedin Premium account?